Got Cancer Questions? This Little-Known Hotline Can Help : Shots - Health News For 40 years, people have been able to call a service funded by the National Cancer Institute to get information about cancer treatments. Doctors say it's still useful even in the age of Twitter. Jill Wiseman answers questions for the Contact Center based at the Fred Hutchinson Cancer Research Center in Seattle. If you were worried you had cancer, who would you call for information? Chances are a federally-funded cancer helpline isn't the first place that pops into your mind. But for 40 years, a helpline funded primarily by the National Cancer Institute has been answering people's questions about cancer. It's a source of information for people who have been called back for a follow-up after routine screenings and are worried they might have cancer. And it can also help cancer patients get information about participating in clinical trials and help them figure out questions to ask their doctors. 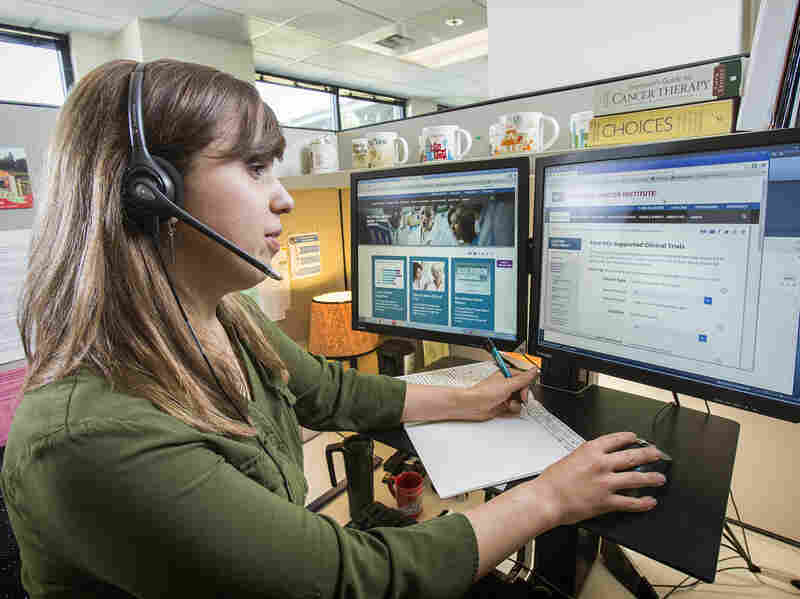 The Fred Hutchinson Cancer Research Center in Seattle runs the Contact Center, which is funded mostly by the National Cancer Institute with some support from the Veteran's Administration. Last month, the NCI awarded Fred Hutch a $24 million, three-year contract to continue operating the helpline. "There will be about 1.7 million Americans diagnosed with cancer this year. For many of them, access to good information can be the difference between life and death," says Peter Garrett, a spokesperson for the National Cancer Institute. More than 91,000 people reached out to the Contact Center via phone, email or social media in 2016 — a total of about 250 inquiries per day. This year, more people have been contacting the center through a live chat, email or social media than with a phone call, says the center's director, Nancy Gore. "Over the years, call volume has declined although the complexity of the calls has increased," says Gore. "People seek information via the Internet, so [they] can often find answers to basic questions such as general cancer symptoms, a common call before the Internet became pervasive." Now, people more often need technical information about clinical trials and gene therapies, she says. But the helpline remains relatively little-known by the general public. About 10 percent of those inquiries were from repeat clients, according to data provided by the center. Back in the 1980s, more than 20 cancer call centers operated around the country. Now there's just one. Assuming that the cancer center spends about $8 million this year to handle a similar number of inquiries, by our very rough calculation that adds up to a cost of about $87.14 per inquiry. There's no limit on the amount of time a helpline staffer can spend on the phone with a client. Eric Suni, a cancer information specialist at the center, says he has occasionally spent more than an hour on the phone with a caller during the seven years he's worked there. "Sometimes people will call and say they have one quick question, but answering that one quick question requires a much more in-depth discussion because you can only answer that question by explaining some other concept," Suni says. "Even those that seem like, oh, this should take two minutes to answer is actually a much more involved conversation. So you never really know until it actually starts to unfold." Hotline staffers, who are required to have a four-year college degree, spend six to seven weeks in initial training. The center calls this process "the metamorphosis from civilian into a Cancer Information Specialist," in a training overview document. It's hard not to think that the call center had become less necessary in an era when people can Google symptoms and get advice in patient groups on Facebook, but Gore says there's still a need. "In fact, it is such a common, common comment that is shared with us that they [the clients] wish they had known we were here when they were first diagnosed, or when their mother was diagnosed," Gore says. Gore's husband died of melanoma when he was 34. She didn't know much about his disease at the time of his diagnosis, she says. "Until a cancer diagnosis is part of someone's family or close friend situation people are aware of it, but until it hits home you're not that in tune to it," Gore says. "Once it actually hits home, then people have intense interest and a thirst for knowledge because they want to understand." Doctors may explain information to patients, but sometimes the shock of a cancer diagnosis can make it tough for a patient to focus. "For most people, you don't hear anything after the diagnosis. You're just processing the words," Gore says. The NCI estimates that about 4 in 10 people in the U.S. will be diagnosed with cancer at some point in their lives, according to data from 2010 to 2012. Callers to the hotline ask most frequently about breast cancer, according to 2016 data, followed by other more common cancers including lung and prostate. And more people called with questions about a spouse, friend or relative than about themselves. The people who reach out to the center in English tend to be in their 50, 60s and 70s, but those who seek a conversation in Spanish are generally younger – most are in their 30s, 40s or 50s. Other sources of information about cancer also exist, such as a 24-hour hotline run by the American Cancer Society, which received about 744,000 inquiries last year. Dr. Deanna Attai, a clinical professor of surgery at the University of California Los Angeles, participates in the weekly Breast Cancer Social Media chats known as #bcsm. She says she got involved after she noticed a Twitter conversation where a breast cancer patient was asking for treatment advice. Attai started a private conversation with the patient, offering her advice about reliable surgeons. She calls it her Twitter "ah-ha" moment. "Just by stumbling across a conversation in the middle of the night, you could really have a big impact," Attai says. "That was for me, when I started to realize where my voice is among the community, that I could act as kind of like a guide." Attai doesn't see social media making the NCI Contact Center obsolete. Instead, the cancer institute could use social media to point people to the NCI as a source of up-to-date, unbiased information. "I think they should be using social media to promote themselves," Attai says. "People don't really understand what the NCI does, unless you're a researcher or physician or maybe someone that's participated in a clinical trial."